China's vehicle sales have breached the 10-million barrier for the first time ever, with 10.9 million automobiles sold in the first 10 months of this year, up 37.8 percent over the same period last year, the China Association of Automobile Manufacturers said yesterday in an emailed statement. This has consolidated its top position in the global automobile market, indicating that the nation has been the first to walk out of the global industry downturn, analysts said. The robust average growth rate of over 20 percent seen so far this year, up from the 6.7 percent average seen in 2008, has been attributed to the government's successful stimulus package, including tax cuts and vehicle upgrade subsidies for rural residents. It is a development that provides confidence and hope to global automakers to offset their losses in Western markets, analysts said. General Motors Co, which stepped out of bankruptcy protection in July, announced yesterday that the automaker and its joint ventures in China would surpass 1.5 million in vehicle sales for the year. With a strong October, the GM China family continued its string of record monthly sales that began at the start of the year, it said. GM China expects to be the first automaker to cross 1.5 million in annual sales in China, after being the first in 2007 to sell 1 million vehicles in a year. "This has been a year of records for GM in China," said Kevin Wale, president and managing director of the GM China Group. "With our new engine and transmission technologies, we are able to present winning products that offer good fuel efficiency to satisfy local market needs." 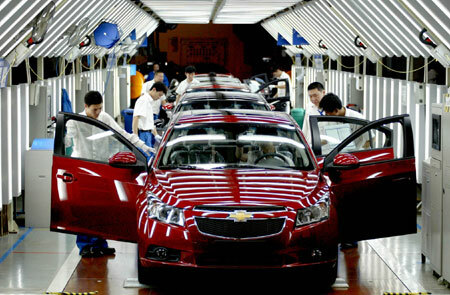 For the first 10 months of 2009, GM's sales in China totaled 1,459,460 units. This was a rise of 59.8 percent from the first 10 months of 2008 and a new record for the period. Despite the National Day holiday at the beginning of the month, the automaker and its joint ventures ended October with 166,911 vehicles sold. This was more than double the number sold in October 2008. Its passenger car joint venture Shanghai GM sold 68,505 vehicles domestically in October, which represented an increase of 109.7 percent from the same month last year, finishing the month number one in sales among domestic passenger car manufacturers. China's battery and carmaker BYD Co also announced yesterday that the Warren Buffet-backed company sold 30,008 units of its F3 car, making the model one of the best selling vehicles in the domestic market and the first car to sell more than 30,000 units in a single month in China. The homegrown model, which hit the market four years ago, has topped China's monthly best selling model for six months since October 2008. The company, ranked the seventh among Chinese car manufacturers last month, sold 46,600 cars in October.